Interaction has completed the offices for design-led gifts and products company Wild & Wolf, located in Bath, England. One of our latest interior office designs in Bath, creators of design-led lifestyle products Wild & Wolf wanted an equally creative headquarters. They were looking for a space that would double up as a workplace and showroom for their unique array of products. 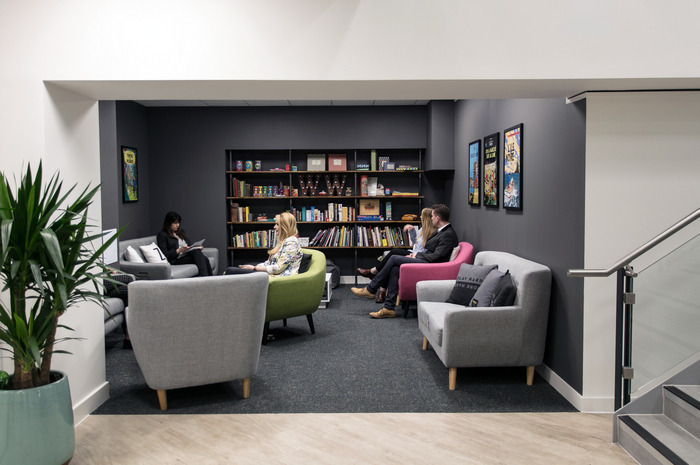 Having recently taken residence across three floors at Manvers Street, Wild & Wolf wanted an agile workspace that would help to inspire and facilitate their working culture. After working closely with the Wild & Wolf team and completing a thorough workplace analysis (which included staff interviews), the Interaction design team were able to find out exactly what features were necessary to enhance the team’s productivity. The result is a space that has been made-to-measure and combines the client’s practical requirements with a creative flair. With bespoke joinery, flexible storage spaces, collaborative areas and meeting rooms, this interior office design in Bath now matches Wild & Wolf’s growing reputation in the product design sector, and will enable far more efficient ways of working. The key features of the space include a showroom to display the high standard of products, a large forest acoustic graphic in the breakout area, and a tailor-made storage for both the workplace and showroom. There is also bespoke joinery throughout, to reflect Wild & Wolf’s unique brand. The space also includes an array of flexible spaces for work and downtime.